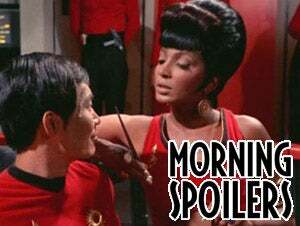 Today's spoilers include a new Star Trek video and some reviews. Dan Aykroyd talks Ghostbusters 3, and a Transformers villain is explained. There are tons of Doctor Who set pics. Plus Dollhouse, Fringe and Heroes. As you'll know if you've read the comics, the villain Nero is pissed because Spock failed to prevent the destruction of Romulus, so he travels back in time and tries to kill Spock and the rest of the Enterprise crew. And we glimpse the fact that Nero is in pain from the loss of his home planet. Ballard's investigation leads him to the agoraphobic designer of the Dollhouse (guest star Alan Tudyk), and the story of "Sleeping Beauty" foreshadows Echo's future, while allowing her to help a young girl deal with her traumatic past. Adelle goes to the attic in search of answers, while Alpha reveals himself and sets his game in motion. Now that we're warned that they may be deceiving, here are more set reports. One scene was filmed featuring Wilf wearing his holiday Reindeer hat, dancing to get the attention of a tour-bus for over-50 holidayers. The bus stops and he gets on. And June Whitfield was spotted on set, apparently playing Wilf's friend Henrietta Goodheart. In another scene, Donna is getting married - yet again - to an unidentified actor. Wilf is there, and the Doctor and the TARDIS were also glimpsed, so maybe the Doctor crashes her wedding. Meanwhile, there's a scene in a back alley, between Donna and John Simm's Master. The master is carrying a mask, of a human with gray hair. Also in the scene are a guy wearing a boy tie and a white-haired man. And the Doctor visits Sarah Jane Smith's home, at Bannerman Road. Luke is talking on his cell phone while hurrying across the street, and nearly gets run over. The Doctor pushes him out of the way in time. Luke realizes who the Doctor is, and they have a brief conversation before the Doctor walks away. Luke runs to fetch Sarah Jane, and they stand and watch the Doctor walk to the TARDIS. He turns to wave, and Sarah Jane cries. The Devil (Ray Wise) wants Sam (Bret Harrison) to begin his training to bring about the end of days so he sends him a tutor named Sally (guest star Simone Kessell). Sam decides to seduce Sally to get information from her about how to beat the Devil. Meanwhile, Nina (Jenny Wade) takes revenge on Ben (Rick Gonzalez) and Sock (Tyler Labine). DAVIS ASKS CHLOE TO LEAVE TOWN WITH HIM - Clark (Tom Welling) discovers that Davis (Sam Witwer) is still alive and confronts Chloe (Allison Mack) about protecting him. Oliver (Justin Hartley) discovers Jimmy (Aaron Ashmore) breaking into Chloe's apartment, but things get rapidly worse after Davis jumps from the shadows and attacks both of them.